A. A solid fiddle that fits tightly around the top of the stove helps keep spills in place. To prevent it from interfering with the handle of a frying pan, the front part of this fiddle is hinged. B. Before you move the pots to one side of the burner to simmer, make sure the pot clamps will be able to hold them. C. You can make this tray to mount on your stove. Once installed, it will keep items like full mugs level. Make the tray removable so you can pass it, and the mugs, up to the cockpit crew. that could cut your hand. E. Whenever possible, the broiler shelf should also have a fiddle to keep things from falling out. F. An oven door latch, or lock, that you can open with one hand is the best arrangement to have at sea. G. An oven shelf should also have a fiddle to keep pots from falling out when you open the door. 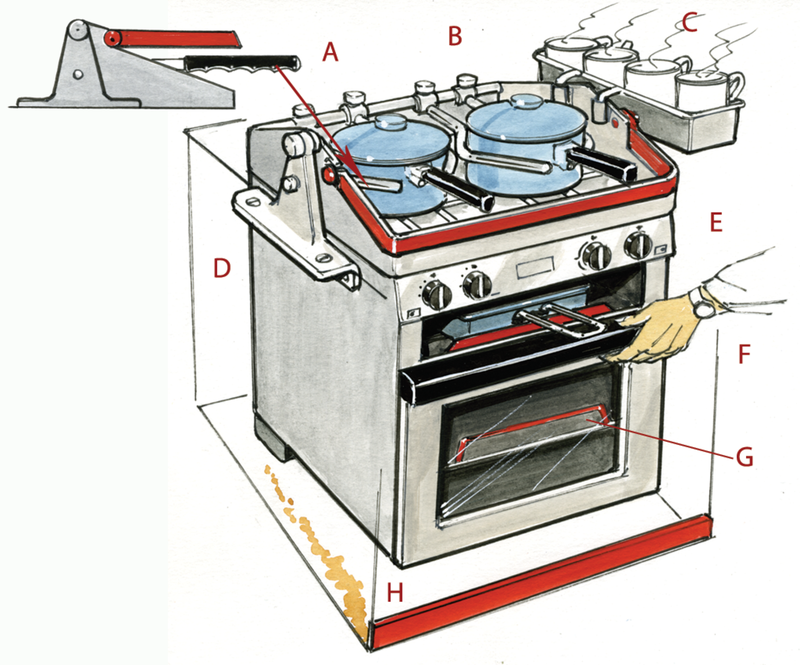 H. If the space under the stove slopes forward into the cabin, you can install a fiddle in front of the stove to keep drips off the cabin sole. I. By raising the stove’s gimbals you can make it safer to use heavy pots on the stovetop. Another way to create a counterweight is to put a heavy pan in the oven. J. 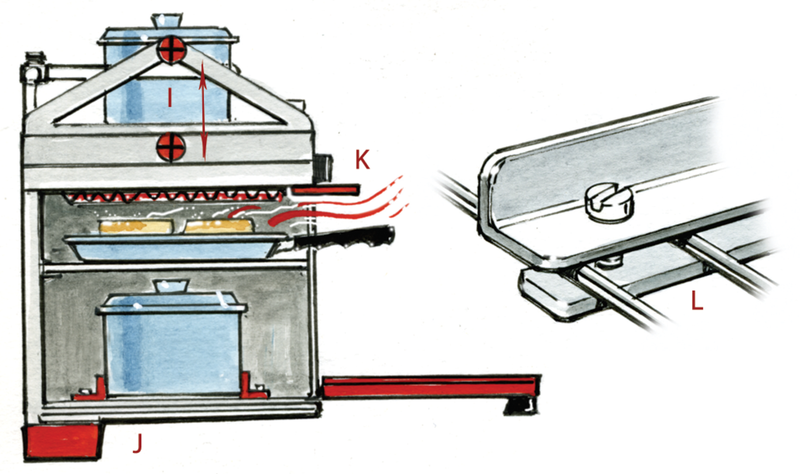 Some stoves benefit from having another counterweight that will keep them from tipping when the oven door is opened. K. If your broiler has a heat shield, make sure the crew know how to use it, otherwise, the plastic control knobs might melt. L. It isn’t hard to make moveable shelf clamps that will hold pots in place during rough weather. M. If space is tight, a sliding pivot point will give you a stove that is fixed, but can also swing. Almost all gimballed stoves can be locked in a level position. Some cruisers prefer to have the stove fixed at sea. However, they are also careful to use big fiddles on the stove, and they cook with deep pots. N. To keep a grill pan from rattling at sea, put a wooden chopping board inside the pan and then drill four holes to hold the grill’s feet. Don’t forget to take it out before putting it in a warm oven. O. Make sure the gimbals are strong enough; they’ve been known to come loose or break in heavy weather. P. Traditionally the galley is on the port side, so you can heave-to on starboard tack. 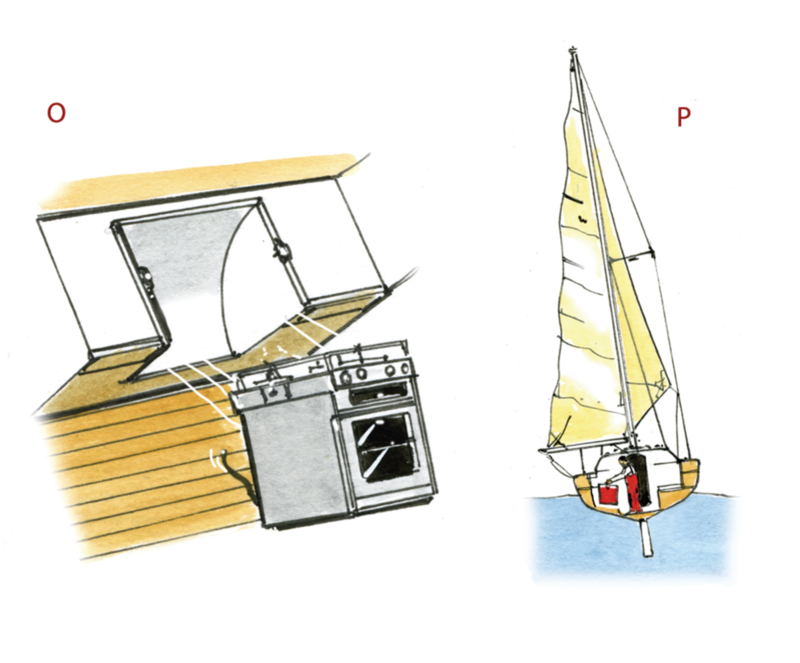 You not only have the right of way over other vessels, the stove is on the leeward side, which makes life easier for the cook.